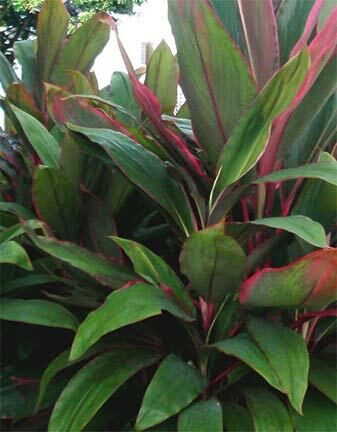 The cordyline is a hardy plant that provides colour 365 days of the year. It is also known as the good luck plant - its tough nature makes a great gift. With its magnificent lush foliage is a must for the tropical garden inside or out. It makes an excellent container plant as it can be easily pruned to shape, but is also beautiful as an understory or feature plant out in the garden. Fragrant white flowers are followed by bright red berries. Also known as Ti plant. Full sun to part shade, avoid heavy frosts. For indoor pots: Cordylines like being pot bound but can be repotted every second or third year. Do not water on leaves because they will spot. Oiling leaves should also be avoided. Less water is needed in winter. Feed every two months with a diluted seaweed. Will tolerate low light, likes artificial light. Prefers a warm temperature with a winter minimum of 4 celsius. Needs good drainage. Indoors watch for aphids, mealy bugs, scale and thrips. To get rid of pests, place outdoors in semi shade, spray with a jet of water or remove pests by hand.